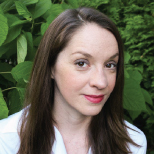 Courtney Humphries is a freelance writer in Boston who covers science, medicine, and culture. Her work has appeared in the Boston Globe, Wired, Science, Nature, New Scientist, and other publications. She has a masters degree in science writing from MIT.